I had 3 days to spend before my new crew arrived. They were spent with cleaning and tidying up the boat after continous sailing since mid November.From the Solomon Islands to Japan. Sunday I treated my self to an excursion to IKEA in Shingu Fukuoka. It took me about 2 hours to get there involving walking, underground and a bus ride. It is not easy to find the right bus when everything is in Japanese. Anyway it was nice to eat meatballs with mashed potatoes, cream sauce and lingonberries. I loved it and so seamed hundreds of Japanese people to do also. 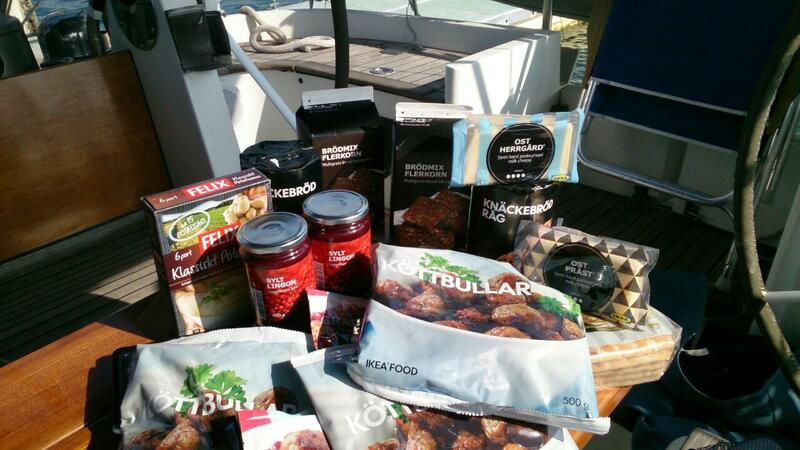 After a lovely meal I went to the food shop and bought as much as I could carry of meatballs, lingonberries, hard bread and cheese. Monday turnedout to be a holiday here in Japan. The spring equinox is holiday in Japan and as that fell on sunday this year, monday was a holiday! As I was working away with cleaning the boat, suddenly Ivan and Lone was on the dock. They came with the Shinkansen from Tokyo. We went out for a dinner at a local restaurant, which turned out to be Indian. After enjoying some hot food we retired early.